Reuters is an international news agency headquartered in Canary Wharf, London, England. The Reuter agency was established in 1851. Reuters employs several thousand journalists. Reuters journalists use the Reuters Handbook of Journalism as a guide for fair presentation and disclosure of relevant interests, to maintain the values of integrity and freedom upon which their reputation for reliability, accuracy, speed and exclusivity relies. After investigation, Reuters published a lengthy analysis entitled "China co-opts a Buddhist sect in global effort to smear Dalai Lama." "The Dorje Shugden movement gets clandestine support from the Communist Party. Their joint campaign to discredit the Tibetan spiritual leader is paying off, especially in Britain. The protesters are members of a sect that worships Dorje Shugden, a deity its devotees revere as a protector. The Dalai Lama discourages the practice, advising his followers that Dorje Shugden is a malevolent spirit. 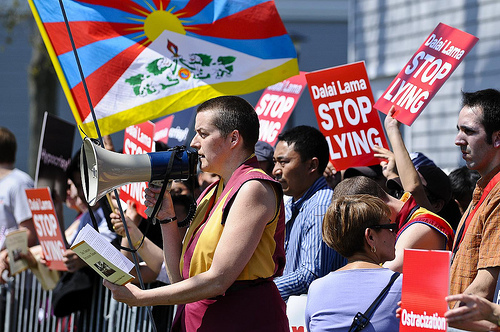 Tibetan and foreign protesters say the demonstrations are organized by an umbrella group called the International Shugden Community, which in the United States is registered as a charity in California. A leaked internal Communist Party document shows that China is intervening in the dispute. The party document, issued to officials last year, said the Shugden issue is “an important front in our struggle with the Dalai clique”. The protests have become so strident that the Tibetan spiritual leader has been alerted by U.S., Indian and other intelligence agencies that there is “now a serious potential threat to the Dalai Lama’s well-being,” according to a briefing document reviewed by Reuters. That assessment is contained in the 18-page briefing prepared for the Dalai Lama's official representative in the United Kingdom, the Office of Tibet, ahead of the Tibetan religious leader’s two trips to Britain this year. The document, which was provided to the British Foreign Office, also reported that the U.S., Dutch and Swiss governments had tightened security during the Dalai Lama’s recent visits. “There’s a lot of passion around this from Shugden practitioners, and the Chinese have fostered this Shugden worship as a way to split Tibetans,” said Kelley Currie, a senior State Department advisor on Asia and Tibet from 2007 to 2009. In December 2014, the International Shugden Community offered 40 free return flights from Manchester to Rome when the Dalai Lama was scheduled to attend a meeting of Nobel laureates in the Italian capital, according to a notice that was posted on the group’s website. The offer included meals and accommodation for protesters. The majority of rank-and-file protesters are Westerners who follow the New Kadampa Tradition, or NKT. Members say the group plays no role in the protests. (FALSE: almost all involved in the protests, their organization and their literature are from/by NKT. Also, Kelsang Gyatso said he organized the protest campaign) It doesn’t disclose how many devotees it has, but former members estimate there are about 6,000 worldwide. In the past two years, protesters have penetrated the Dalai Lama’s security cordon to confront him personally. In May last year, Shugden Buddhists attempted to check in to the hotel where he was staying in the Netherlands, according to the security briefing provided to the British government. Hotel security staff ejected them, visit organizers said." Undoubtedly, virtually anyone thinking about visiting an NKT center would not do so if they knew the truth about NKT, Kelsang Gyatso's hateful politics and NKT retaliations against those who leave NKT indoctrination.